The streets of Exarchia are nearly empty. Most Athenians have left town for Easter, one of the biggest holidays of the year here, so these regularly bustling streets are dead. The shops and cafes have their security gates locked down, revealing colorful anti-authoritarian spray painted art. 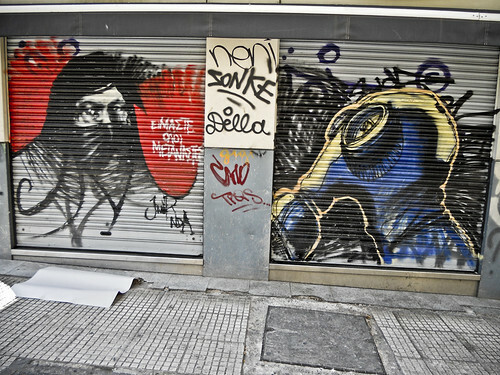 Images of rioters wearing gas masks, slogans against capitalism and government, and tributes to imprisoned militants cover the walls of nearly every building, revealing a glimpse into the counter-culture that usually thrives here. Signs of the December 2008 riots can still be found here. A government building that housed the Ministry of Finance stands empty; a burned out shell of what it once was. 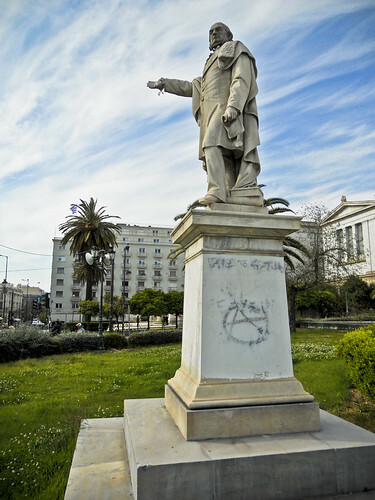 Windows are still cracked on other buildings, political slogans are not fully washed away, and spray painted stencils of Alexis can be found on marble pillars throughout the city. This neighborhood is home to the Polytechnic University, where many confrontations between students and police have taken place. In Greece, cops aren't allowed on universities. On November 17, 1973, dozens of students rebelling against the military government were gunned down by troops at the height of a massive protest movement. Only a few months later, the government fell and was replaced by a modern Democracy. 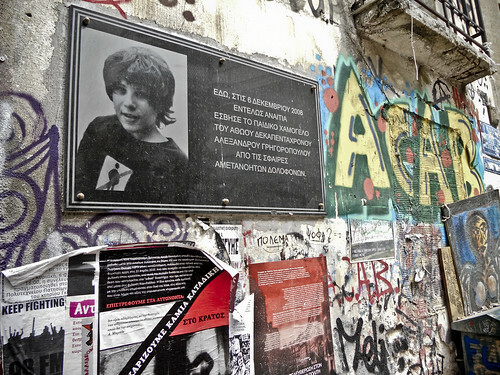 Greeks have not forgotten this event and are on guard against attacks on their freedoms. They are especially sensitive to police incursions onto universities, and are often forced off by students and anarchists who refuse to let history repeat itself. Mayday is just around the corner, and only ten days later is a general strike. The Polytechnic campus in Exarchia will undoubtedly be at the heart of many confrontations that will take place in this coming month. 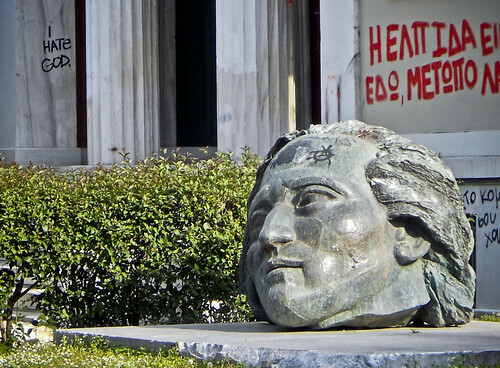 The Greek economy is in shambles, workers are under attack, and the people who live in this country are furious. Everyone here is talking about the general strike as something that has the potential to start a revolution. Many are comparing the current crisis to the crashing of the Argentinian economy in 2001, which lead to massive rioting by all sections of the population. 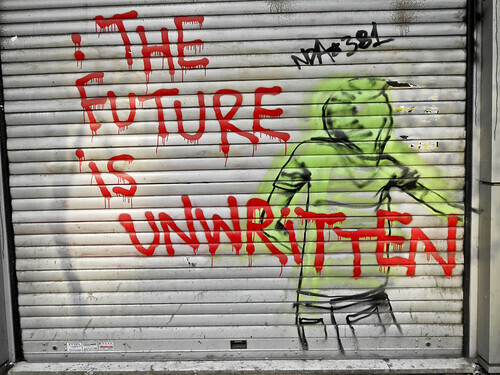 Ten years have passed since then and the Greek government is in a very similar situation. They are trapped by the high value of the Euro, and are being forced to financially attack their own people by the IMF and the European Union. Greece is a powder keg. Will the May 11th general strike be the spark? I am reading your blog. I am excited for more. Please keep posting your insights (and incites?). Faithfully yours, I am awaiting your return to the ring.